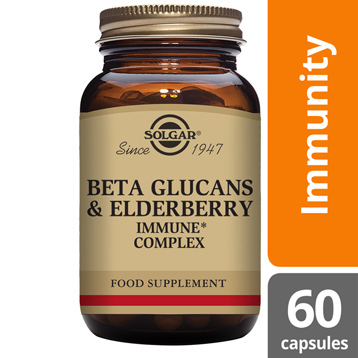 Solgar® Beta Glucans & Elderberry Immune Complex is a unique blend of immune supportive nutrients. 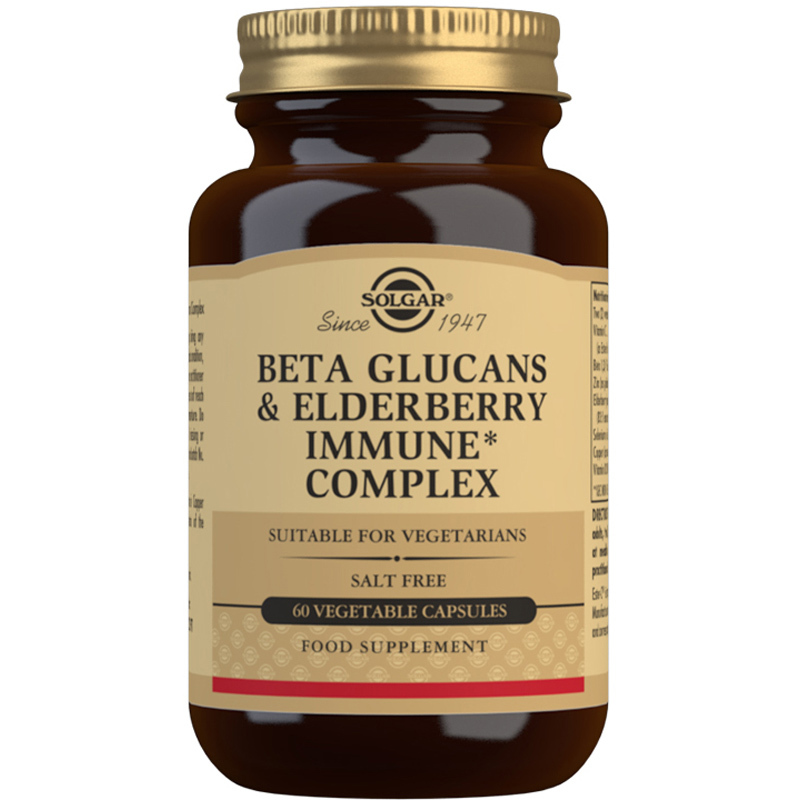 This unique formula combines seven key active ingredients including a pure Elderberry 83:1 extract, equivalent to 4 grams of dried elderberry fruit. 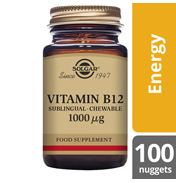 Ingredients: Vitamin C (as Ester-C®, calcium ascorbate), Beta 1,3 Glucans (from yeast cell wall concentrate), Vegetable Capsule Shell: hydroxypropylmethyl cellulose, Bulking Agent: microcrystalline cellulose, Berry Blend (Standardised Elderberry Powdered Extract [berry], Blueberry Powder [berry], Acai Powder [berry]), Zinc (as picolinate), Selenium (as L-selenomethionine), Anti-caking Agents: (silicon dioxide, vegetable magnesium stearate), Copper (as citrate), Vitamin D3 (as cholecalciferol). 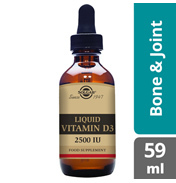 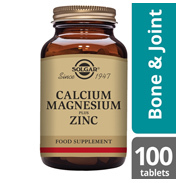 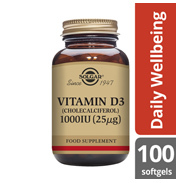 The formulation also contains 2,000 IU's of Vitamin D3, 400 mg of Ester-C and 15 mg of Zinc - nutrients which all contribute to the normal function of the immune system. 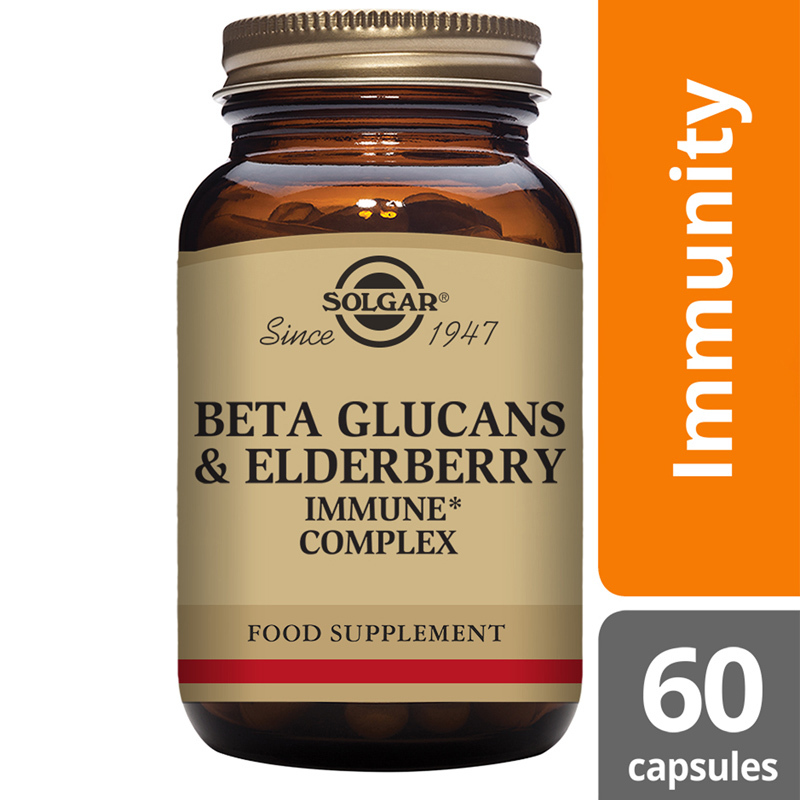 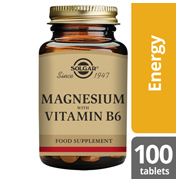 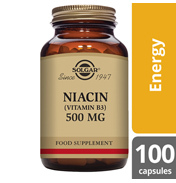 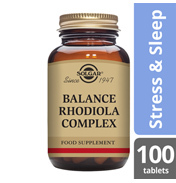 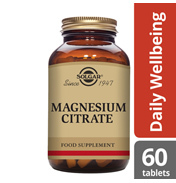 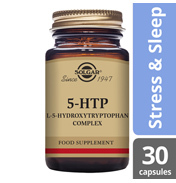 This formula includes 250 mg of Beta 1,3/1,6 Glucans ingredients per dose. 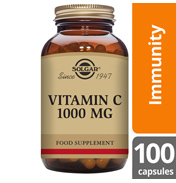 Vitamin C (as Ester-C®, calcium ascorbate), Beta 1,3 Glucans (from yeast cell wall concentrate), Vegetable Capsule Shell: hydroxypropylmethyl cellulose, Bulking Agent: microcrystalline cellulose, Berry Blend (Standardised Elderberry Powdered Extract [berry], Blueberry Powder [berry], Acai Powder [berry]), Zinc (as picolinate), Selenium (as L-selenomethionine), Anti-caking Agents: (silicon dioxide, vegetable magnesium stearate), Copper (as citrate), Vitamin D3 (as cholecalciferol).